Whose streets? Our streets! 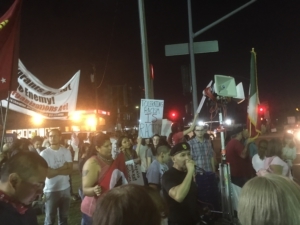 On September 29 hundreds of community members along with several organizations such as ICE Out of Fresno, Fresno Resistance, Brown Berets, ANSWER Coalition and Veterans for Peace hit the streets to voice that they do not welcome Joe Arpaio to Fresno with warm regards. 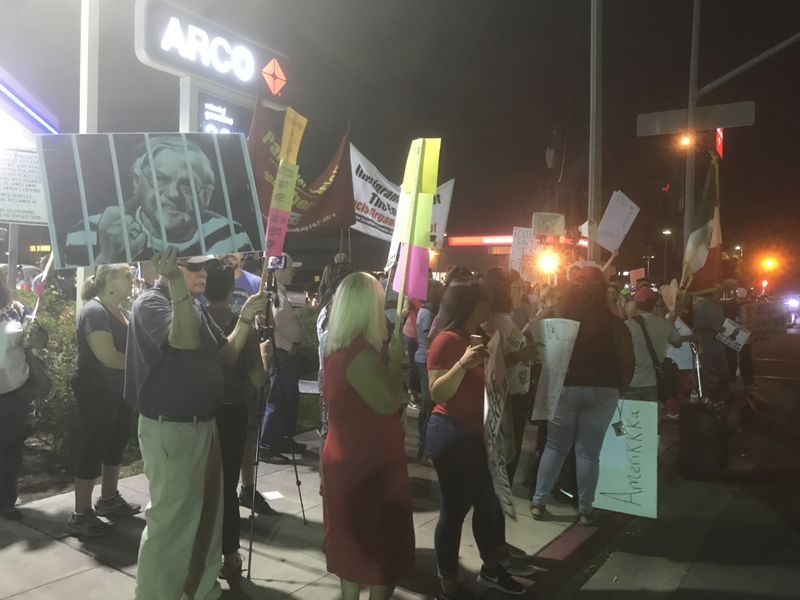 Folks from Los Angeles, Sacramento, Watsonville, Visalia and Merced traveled to attend this counter demonstration to show solidarity with the Fresno community and say no to Arpaio. Driving up to the protest one could see street corners filled with a diverse group of activists and community members standing in solidarity against the visit of racist Arizona Sheriff Joe Arpaio for a fundraiser. His recent pardon by Trump was only the latest insult to working people in what has been a long career of white supremacist terror for the former Sheriff of Maricopa County. Not to be outdone, Fresno County Sheriff Margaret Mims has been illegally allowing ICE agents to work from inside county jails while facilitating deportations. Many saw Arpaio’s visit as a chance for Mims to learn from her Arizona counterpart how to better terrorize Black and Brown communities. Joe Arpaio was the sheriff of Maricopa County in Arizona for 24 years. His history involves the forcing of inmates to live in tents out in the open heat of the desert, which is referred to as “Tent City.” Inmates were continuously subjected to humiliation tactics such as being forced to wear pink underwear, while also being deliberately subjected to high heat temperatures. Arpaio’s past reveals his white supremacy and racism not only in his beliefs, but also in his tactics. He was the leading advocate for the SB1070 law, which is more widely known as the “show me your papers” law, which targeted people of color and undocumented folks. Trump in August, which paved the way for the welcoming of Arpaio in Fresno by the Republican Party. As tensions rose between both groups, police officers attempted to regulate the protest and keep both groups on opposite sides of the street. However, the growing police presence did not deter the community members who continued to chant in solidarity and demand that Joe Arpaio be locked up for his crimes against the people of Arizona. As anti-fascists began crossing the street, it became apparent to all that the people would not tolerate the racism and bigotry being carelessly shouted from across the street. They were met by the fascists right away as a tense stare down between the two sides attracted most of the police presence. It was clear by looking at the four corners of the main street where the protest was occurring that the fascists were outnumbered. Every corner by this point was filled with families from the community and community members standing up for their city and against the injustices that Joe Arpaio and Margaret Mims have committed. Grisanti made an incredible point because we see that there are 12 million undocumented people in the United States who come here to sell their labor power, not because they want to, but because they have no other choice. These folks are escaping unlivable conditions in their homelands whether they are fleeing drug violence, state terror or poverty, all of which are manifestations of capitalism. Then, on the other hand, we see a despicable human being like Arpaio who illegally targeted undocumented and people of color, separating them from their families with impunity. We see that our system actively supports racist and white supremacist criminals, but are criminalizing marginalized, and poor people for simply trying to survive. What had started as 40 Arpaio supporters on one side of the street gradually declined to about half that number and continued to shrink as the sun went down. As another staredown developed, the group opposing fascism held their ground and refused any space to the notorious Alt-Right leader Kyle Chapman, otherwise known as “Based Stickman,” or his buddies. Both sides of the street were now chanting against the fascists, eventually overwhelming them and forcing them to leave. By the end of the action the counter-protesters numbers had dwindled and both sides of the street were filled with anti fascists speaking against the horrific anti-immigrant violence and terror that comes alongside deportations. The media coverage that followed the event was a clearly prepackaged narrative of the police “keeping order.” What they did not show was that it was the people who kept order. While the police joked to each other about the overtime pay they would get for standing around, the people organized to eject the fascists that had come to show their support for Joe Arpaio and Margaret Mims. Once again it was demonstrated in Fresno that the power of the people is the only force that will be able to confront fascism head on. A variety of tactics were employed by a diverse community from throughout California to show that there is no room for any kind of racism and bigotry in the Central Valley.